We demonstrate that optical sensing of nanoscale objects can be performed via computation-aided microscopic imaging ellipsometry. The theoretical simulation is based on an efficient half-space Green’s function method which allows efficient simulation of the diffraction patterns of light scattering from sub-wavelength objects. 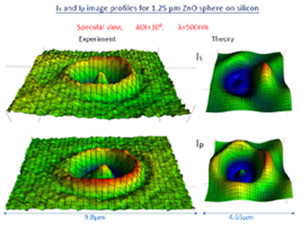 The microscopic ellipsometry images of silicon and ZnO microspheres on a substrate for s- and p-polarized reflectances were taken by a modified Optrel MULTISKOP system with rotating compensator configuration for various angles of incidence and wavelengths ranging from 450 nm to 750 nm. An 80X objective was used and the pixel size for our image is around 164 nm. The images obtained display clear diffraction patterns, which is analyzed by an efficient full-wave simulation. By expanding the electromagnetic fields within the microsphere in terms of spherical harmonics and using the half-space Green’s function method to solve the scattered field, we obtain accurate near-filed distributions on the focal plane. The near-field distributions are then converted to images observed by the CCD camera via a near-field to far-field transformation. The simulated images are then compared with experimental results to gain deep understanding of these diffraction patterns. Mode profiles of the whispering gallery modes are observed and identified theoretically.